Mt Dhaulagiri is the 7th highest mountain peak in the world. 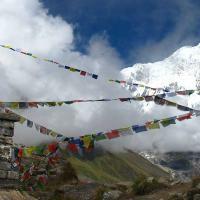 It is situated in the Northwest of Myagdi District of Nepal. The real altitude of Mt Dhaulagiri is (8,167m) from sea level. Mt. Dhaulagiri is one of the most formidable peaks to climb with the first successful summit only in 1960 by the Swiss following from the Northeast ridge. Moreover, in Dhaulagiri region the weather is very changeable, but every day we shall get new weather forecast by Internet and choose the best period for acclimatization and ascent. Dhaulagiri is considered the most interesting peak among the eight thousand meters one. In terms of rise above the terrain Dhaulagiri is unparallel as it rises 7000m over Kali Gandaki valley over horizontal length of 30km, which by any standard is an impressive statistic. Day 03: By Bus: Kathmandu/Pokhara/Beni (1000m). 10 hours/ lodge / camp. Day 04: Beni - Babichaur (1050m) - 5hours/trekking/camp. Day 05: Babichoaur – Dharapani Phedi (1250m) - 4 hours/trekking/camp. Day 06: Dharapani Phedi – Sibang (1850m) - 6 hours/trekking/camp. Day 07: Sibang – Dobang (1800m) 5hours/trekking/camp. Day 08: Dobang – Bagar (2100m) - 5 hours/trekking/camp. Day 09: Bagar – Dovan (2500m) - 6 hours/trekking/camp. Day 10: Dovan – Sallaghari (3100m) – 5 hours/trekking/camp. Day 11: Sallaghari – Italian Base Camp (4000m) - 4 hours/trekking/camp. Day 12: Acclimatization in Italian Base Camp - Trekking/camp. Day 13: Italian Base Camp – Dhaulagiri Base Camp (4900m) – 5 hours/trekking/camp. 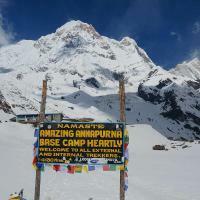 Day 14: Dhaulagiri Base Camp – French Pass (5300m) – French Phedi (4900m) – 6 hours/trekking/camp. Day 15: French Phedi – Thapa Pass (5250m) – Kalopani (5000m) – 6 hours/trekking/camp. Day 16: Kalopani – Marpha (2667m) - 6 hours/trekking/camp/lodge. Day 18: Drive Marpha – Ghasa- Tatopani 4- 5 hours/camp/lodge. Day 19: Tatopani (1189m) – rest day at and enjoy natural hot spring/camp/lodge. Day 20: Tatopani - Ghorepani (2855m) - 8 hours/trekking/camp/lodge (or trek to Beni and drive to Pokhara and next day drive or fly to Kathmandu is possible). Day 21: Early in the morning ascends to Poonhill//trekking/camp/lodge (3200m) for beautiful sunrise and the majestic views of Annapurna and Dhaulagiri ranges, after breakfast proceed to Tadapani (2700m)-6 hours. Day 22: Tatopani - Ghandrung (1951m) - 2½ hours. Visit ACAP Headquarter and Gurung culture museum. 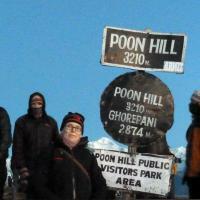 Day 23: Ghandrung – Nayapool (1070m) - 5 hours. Drive to Pokhara - 3 hours. Day 24: Pokhara - Kathmandu (By bus or flight).